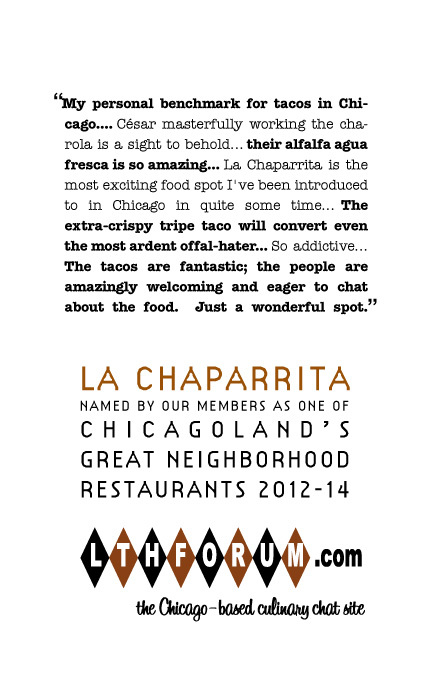 It is a pleasure to nominate La Chaparrita #1 as a Great Neighborhood Restaurant. I have been to La Chaparrita at least a dozen times since I first tried it last summer, and I honestly can’t think of a restaurant in Chicago more deserving of the title. First, La Chaparrita is a quintessential “neighborhood” restaurant. It’s on a quiet, tree-lined street in the Little Village. As soon as you walk in, you get the feeling that this is a local place that will continue to serve the local population long after the foodie hordes have moved on to the next new thing. Angelina and her staff could not be more friendly and welcoming, and Cesar masterfully working the charola is a sight to behold. The food is nothing short of spectacular. I honestly think almost any single item on the menu would be good enough to nominate this place as a GNR. The grilled onions and jalapenos seem so simple. . . so why can’t I find a version this good anywhere else in the city? Recently, on the Shopping & Cooking board, there was a discussion regarding how difficult it can be to find consistently hot jalapenos. You won’t have that problem at La Chaparrita – their peppers are always fiery, not to mention perfectly seasoned and grilled. The salsas are also some of the finest I’ve ever had. Spicy, with a remarkable depth of flavor that pairs perfectly with the food. And if Mario’s is a GNR for serving Italian ice, surely La Chaparrita’s incredibly refreshing aqua frescas should qualify it for similar recognition? Rene G described them as “best-of-type”, and I am inclined to agree. The tacos themselves are some of the best in the city, if not the best. The tacos al pastor are delicious, even without the use of a trompo. The lengua, molleja and sesos are all unusual tacos that I rarely even see on most taqueria’s menus, let alone executed as well as they are at La Chaparrita. The asada you can find on any taqueria’s menu, but I have never had an asada taco that so expertly highlights the flavor of the meat. The extra-crispy tripe taco will convert even the most ardent offal-hater. Did I mention that the most expensive taco on the menu is $2, and most can be had for $1.50? If some place on the north side started offering tacos this good at prices this low, it would cause a stampede. Very much agree w/ronnie. La Chaparrita reset my baseline. Yes on GNR. Although I still very much prefer the tacos al pastor at Tierra Caliente, la Chapparita remains my favorite for just about any other type of taco you can mention. The owners and staff are wonderful hosts. I strongly support this nomination. In fact, there a crispy tripe taco in my near future. Ideal Machine wrote: No brainer for me. I agree. This is a quintessential GNR. In fact, in my mind, this was one of 3 no-brainers this GNR season. I don't know what else I can say beyond what I've already posted on the main La Chaparrita thread (linked above). Normally a good thing, but sadly dissapointing when I went this winter and found they had run out of sesos!! No matter, every taco I had was perfection in masa. A choreographed ballet of unctuous meats, sharp onion, fragrant cilantro, and hell-fire salsa; these tacos dance the sublime. And those knob onions - sous vide in rendered fat and sprinkled with salt. My third eye opened on first bite. Nirvana. If I still lived in Chicago I would be eating there every week. I'm almost embarrassed to be endorsing La Chaparrita #1's nomination figuring it's such a complete layup. La Chaparrita #1 is so good that I almost get a bit sad thinking about how it has flown under our collective radar for so many years. This is one of the few places that if it went out of business my quality of life here would certainly be diminished. IMO, their well crafted tacos are pretty much in a league of their own. La Chaparrita #1 is easily amongst the top cheap eat restaurants I'm aware of in Chicago, of any kind. Also, If their charola master doesn't get an invitation (obviously, along with their owners) to the next GNR awards dinner, we really should stop having them. The man's attention to detail when constructing each and every taco is almost scary. While you're eating there the next time, take a look over your shoulder. I'm betting this guy will be trying to anxiously see how much you appear to be enjoying the tacos. I've busted him numerous times! We'll always laugh towards each other afterwards. If this place isn't a GNR, I don't know what is. Just wish it was closer to MY neighborhood. If anyone here has reason to kill someone chances are I'll be deciding your fate. Three times in the last four years I've been picked to serve on juries and have wandered around 26 & California looking for something to eat. Thanks to the intrepid Mike G my go to was Carniceria Auguascllients, but then the ever chatty G Wiv found out about La Chaparrita and my life changed, I have a new place! The food has been written about by others, but what really stands out for me is the warmth of the family who run it. Some speak perfect english, but those who don't are ever patient with my kitchen spanish and are happy to feed me incredible tacos. The crispy tripe has me driving out of my way for lunch. I too, wish it were in my neighborhood. A GNR slam dunk. Prior to finding out about LTH, I thought the Burrito House on Lincoln and Addison had good tacos so maybe I'm not the best person to judge but these are now just about the only tacos I ever want to eat. Lengua, tripa, chorizo, pastor--heck, I don't think I've had anything there that I wouldn't rush back to devour. GNR for sure. I just have to make sure I keep my murderous impulses to obtain them in check so that I stay out of mbh's crosshairs!!!!!!! I don't know if I can fully support this nomination. First: No real tacos are served here. I asked for a hard shell with ground beef, lettuce, tomato and shredded cheddar, and they looked at me like I had three heads! Second: I asked for a chalupa and the lady said she had no idea what I was talking about. Third: All of their salsa was in some plastic squeeze bottle. I couldn't find a jar marked "medium" anywhere. I may change my mind tomorrow. Mods - feel free to delete this tomorrow. Haha, happy April Fool's Day, seebee! I heartily support this nomination -- a perfect GNR candidate. In fact, their alfalfa agua fresca is so amazing I could support a GNR based on that drink alone. The tacos are fantastic, the people are amazingly welcoming and eager to chat about the food. Just a wonderful spot. The tripa and campechano are heavenly with a sprite of lime and squirt of creamy housemade salsa. So addictive.